To most visitors Washington DC is the city of marble. Greek temple of Zeus-like Lincoln. Gleaming white facade of the Supreme Court. Cherry blossom-framed dome of the Jefferson Memorial. But before marble, there was sandstone. Virginia sandstone, to be exact. My first extended stay in DC was during a college internship. I spent the summer working at the State Department (in the good old pre-9/11 days when non-citizens were allowed to do that). The internship was 10 weeks long and at that point I had no idea if I would ever make it back here again so I was on a mission. Each Thursday I picked up the City Paper and frantically circled events and venues I should visit on the weekend – preferably with free admission given that the internship was unpaid =) One of the places it brought me to was the National Arboretum. Set on 446 lush acres, the Arboretum hosts one of the most striking, and least known, vistas of Washington: 22 original columns of the U.S. Capitol building. The columns originally stood at the East Portico. They were made out of beautiful sandstone from Aquia Creek quarry in Stafford County, Virginia – a key source of construction material for early Washington chosen by Pierre L’Enfant (yeah, like the metro station). Side note: the White House wasn’t always white. The original version completed in 1800 simply featured gray-brown Aquia sandstone. The walls weren’t painted white until the reconstruction after the torching by the British during the war of 1812. But I digress… By the time the Capitol dome was completed in 1864, the columns, although structurally sounds, looked like they were not adequately supporting the new, bigger structure. 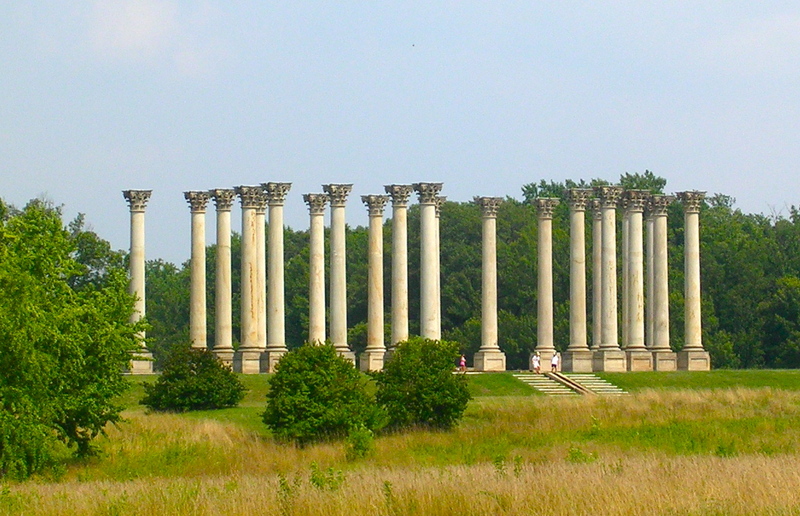 The columns were ultimately removed during expansion of the Capitol in 1958 but it wasn’t until the 1980s that they found a new home at the Arboretum. Today they provide a magnificent view indeed. Set on a foundation of stones from the steps that used to be the east side of the Capitol, the columns tower over an open meadow like an ancient temple. Strolling among them is like taking a step back in time. Not quite Greece but, hey, 200 years is plenty old for this country. Best time to visit – April when the azaleas are in bloom! And the sandstone says sometheting metaphoric about this city. Brought on barges from 45 miles away, it built the very fabric of early Washington. Now as then so little here is “from DC” – including me – but that’s precisely what I like about this town. Most of us come from a significantly furhter distance than the Aquia sandstone did, but somehow end up making this place home. Just like L’Enfant did back when the future site of the Capitol was still, in his words, “a pedestal waiting for a monument.” We shape this place, it shapes us.